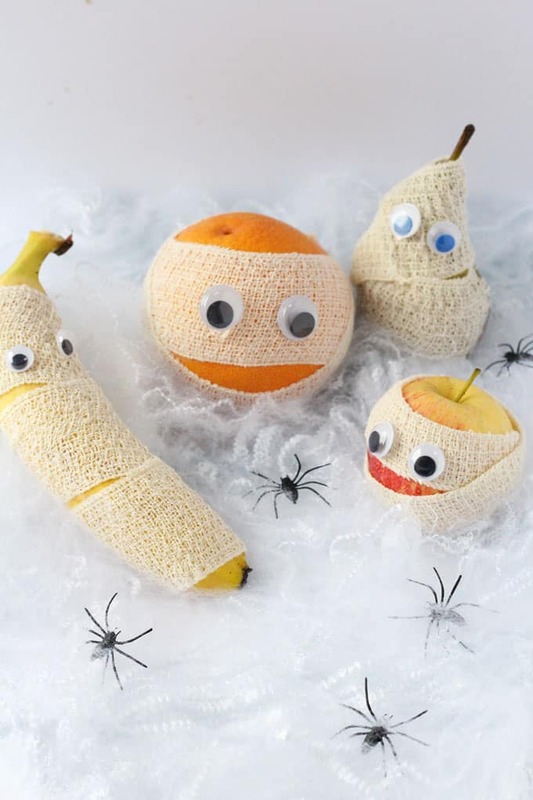 Fruit Mummies! 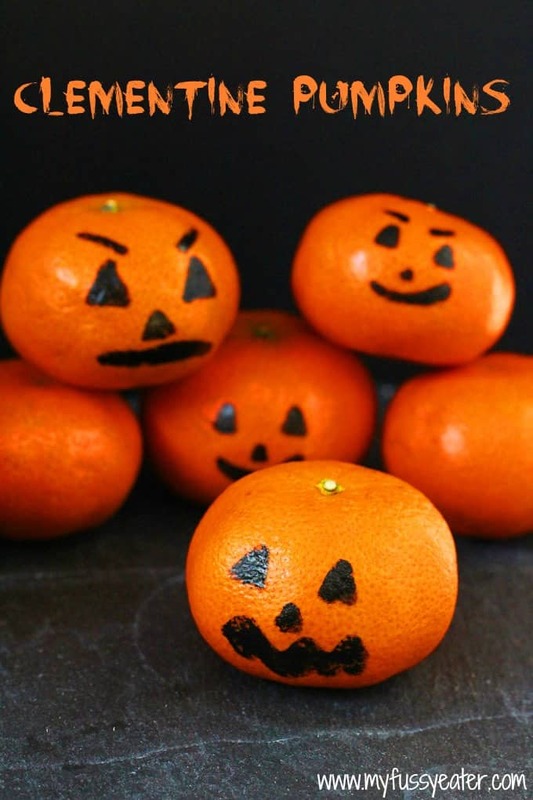 A fun and healthy Halloween snack for kids! Halloween is just around the corner and I’m beginning to dread the amount of sweets and chocolate that are going to flood into the house next week. My children have their fair share of treats every week but the sheer abundance of sugary snacks that go hand-in-hand with Halloween can be overwhelming. So in an effort to counteract the bucket load of E numbers that they’ll pick up trick or treating I’m aiming to keep their sugary sweet intake low for the next few days. 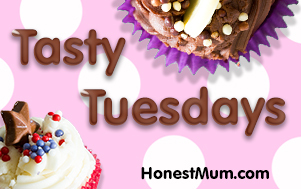 When I saw this post on the Decorated Cookie about Mummy Fruit I immediately wanted to try the idea out myself. 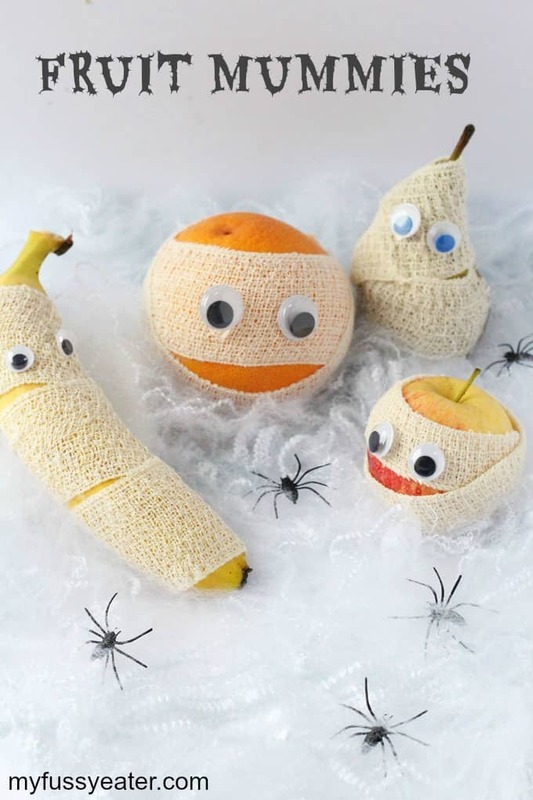 I thought it was such a fantastic way to get into the Halloween spirit without the need for tonnes of junk food! 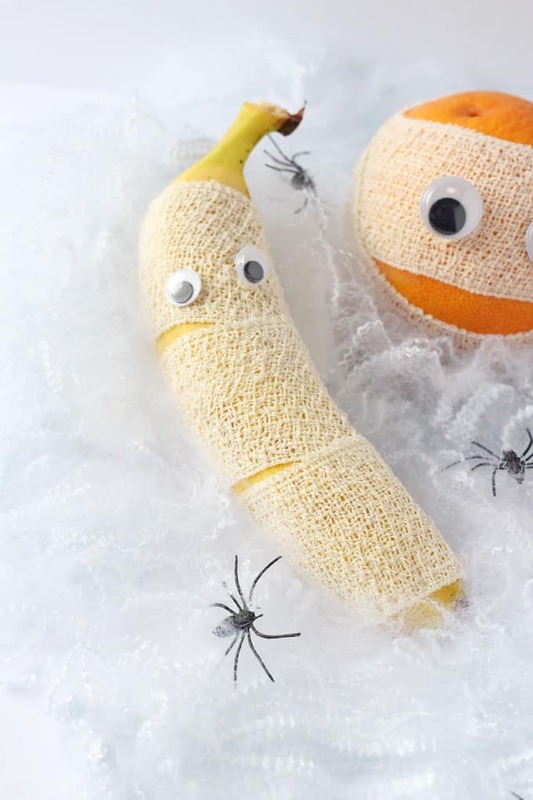 These Fruit Mummies are super easy to make. 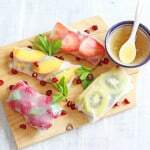 Simply wrap fruit (I used banana, orange, pear and apple) in bandage gauze and secure it with some sticky tape. Then attach some googly eyes, either self-adhesive or again with some sticky tape. 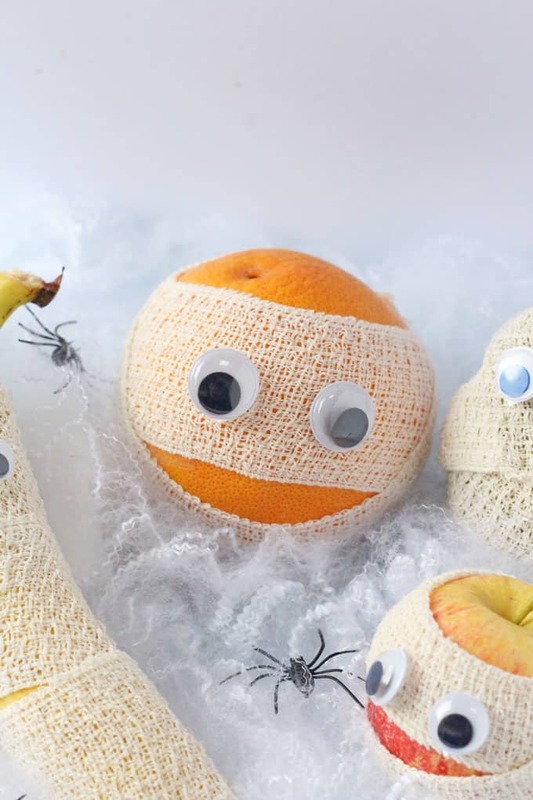 Try popping a Fruit Mummy in your child’s lunchbox as a fun surprise. 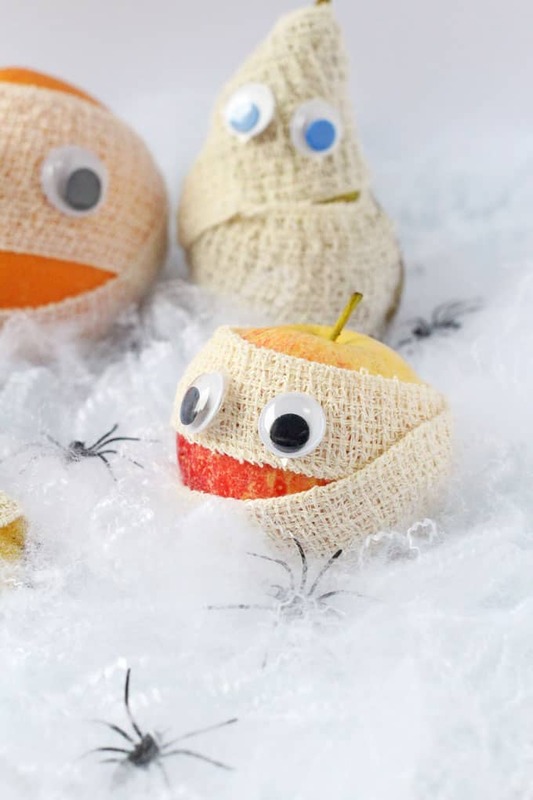 Or a line up of Fruit Mummies would make a quirky addition to a Halloween party too! 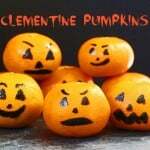 If you liked this post then you might also like my Clementine Pumpkins, another fun and healthy snack that kids will love this Halloween! Super cute! Am going to pop one of these into my son’s lunchboxes as a surpise as he loves all things “mummies”. 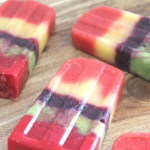 Thanks Helene, the kids loved them and I’ve been keeping a few in the fruit bowl all week! Thanks Vicki, my kids loved them!